Every year the Railway dedicates a week (or two) to undertake large infrastructure projects when the Railway closes down to all but essential traffic in connection with the work being undertaken. And 2016 was no exception. 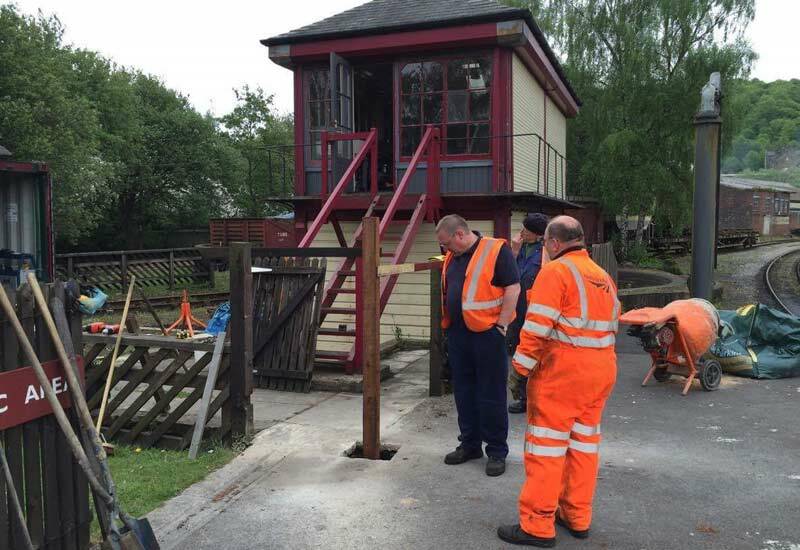 This year there were 3 locations where activity took place, the most major being the replacement of the road surface on Oakworth Level Crossing, necessitating the closure of Station Road. In addition a collapsed culvert was repaired north of Oakworth and down at Keighley, beavering away almost unnoticed, were a small team repainting the station. Once again we are in debt to James Barlow for his report on how the Civil Department are preparing for Civil Week, which this year is Monday 12th – Friday 16th September. We are now very quickly approaching the most important week of the year for the Civil Department. Civil Week! Every year we take possession of the line at the end of summer running to undertake major jobs. As I started writing this news article, despite years of planning, we still did not know what our major job would be. 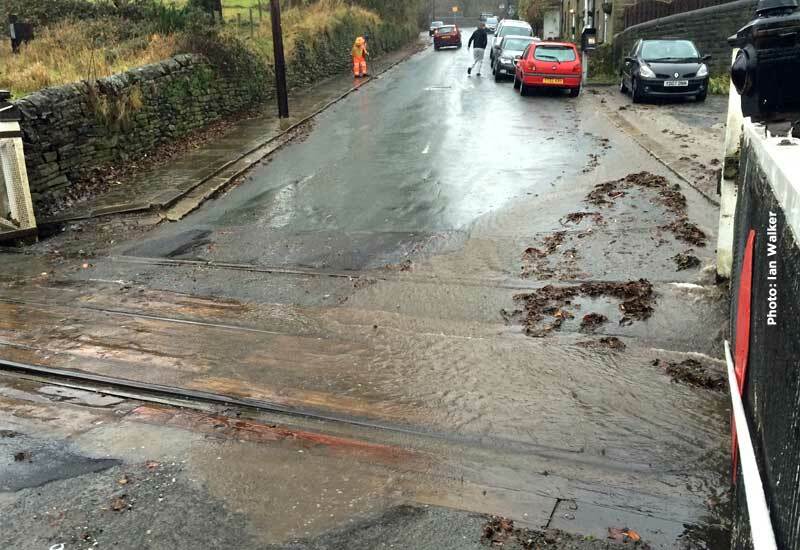 The road closure required to renew Oakworth Level Crossing had not yet been granted. Eventually it was, but this led to us preparing for two jobs in parallel. The renewal of Oakworth Yard turnout was the back-up job and the switches for this can be seen in Oakworth yard being set up. This has now been delayed till next year, but we have already made good progress in setting up, hopefully making preparations for next year much simpler. Now to the jobs themselves. As mentioned above, our major project this year is the renewal of Oakworth Level Crossing. This is renewal of the deck, not the gates themselves. The deck has two problems which have led to severe deterioration of the crossing and the track in the vicinity. The problems being the profile and materials it is constructed from. The profile involves coming down a steep hill before then hitting the crossing, going slightly up hill and then dropping off back down the hill again. This causes larger vehicles to strike the crossing and all vehicles to exert large forces on the crossing. This makes the road and the crossing surface break apart very easily. Any temporary repairs are often very temporary, taking a matter of days to disintegrate. The profile will be eased to reduce the strike action in addition reducing the amount of storm water which is captured by the crossing. This constant flooding has led to very poor track within Oakworth platform. In addition, last year a sink hole appeared beside Oakworth Yard, a particularly deep one. Since then you may have noticed trains passing the yard much slower. This is due to a 10mph restriction placed on the track after the collapse to reduce any further potential damage as much as possible. We will be taking the opportunity during Civil Week to take the track out and repair the deep culvert. A local contractor firm will be undertaking the work on our behalf once we have removed the track. Moving south, Ebor Lane will be the next work site. Although not one of our major jobs, it is likely it will absorb a large amount of the man power. The flat bottom rail here sits on pads to cushion the rail against the sleeper, reduce wear and help distribute forces more effectively. These pads are now in need of renewal, this will involve jacking up the rails and then replacing all the fastenings before lowering the rails back into position. While in the area some small drainage works may take place on the landslip site, this will depend on how well other work goes. Lastly, we will be having another weedkilling run. Due to the problems with the previous contractor the weedkilling was undertaken very late. This, combined with the warm wet summer, has created a rather large explosion of vegetation. This will be addressed as vegetation starts to die back, starting with a September weedkilling spray. Keep a lookout for a Civil Week completion update. 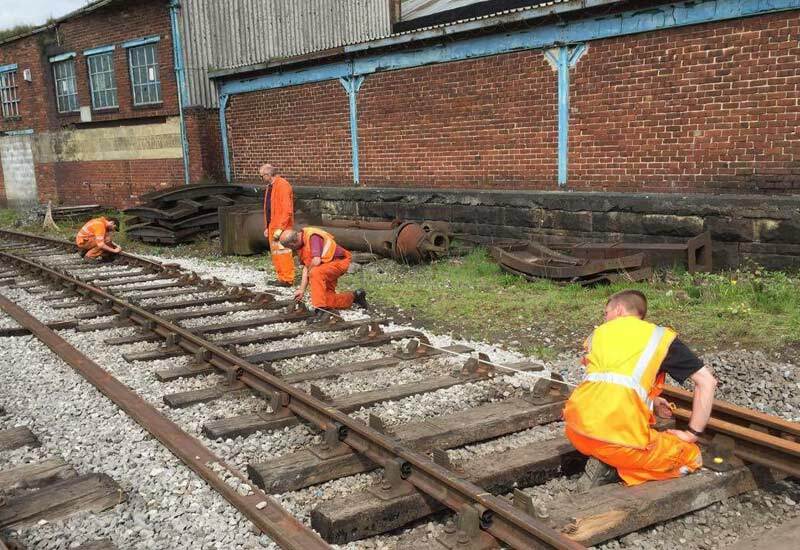 In this, his 2nd quarterly report (his 3rd report in reality, including his S&T report) James Barlow reports on the Civil Maintenance matters around the Railway during the Spring. Here is the second of our regular features on the work being undertaken by our Civil Engineering Department. We are delighted to receive James Barlow’s report on the work undertaken during S&T Week when the Signal & Telegraph Department take possession of the line. As this is the second of the new updates about our possessions, here is a little background. For a long time now the Civil Department has taken a five day possession at the end of summer running to undertake larger maintenance works. September was chosen as a compromise between disruption to summer traffic and the chance of good light and weather. It has always been very successful. The Signalling & Telegraph (S&T) section of the Civils Department have relatively recently started their own five day possession week. Taking place in May and hoping for the good weather again! In reality we may undertake civils jobs in S&T Week and vice versa but there is a main theme for each week. 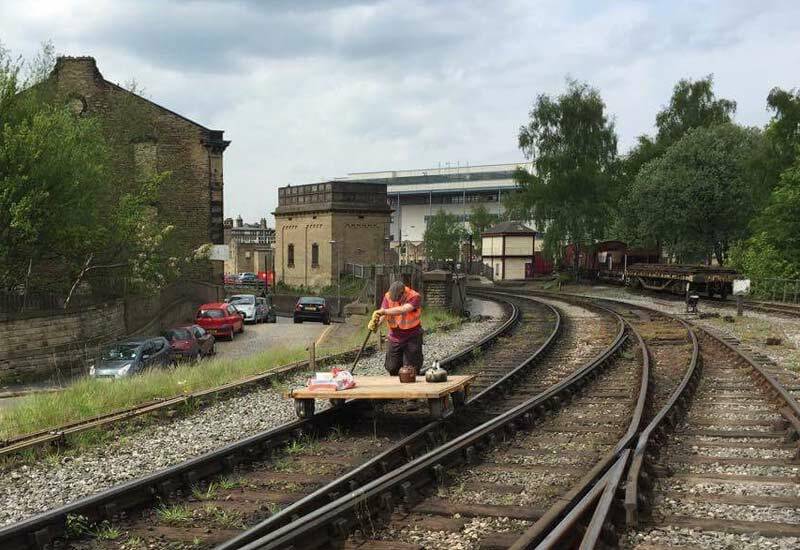 The focus of S&T Weeks since their inception has been the Keighley Signalling Project. Currently, when we open the signalling at Keighley, the signaller is stood outside exposed to the elements issuing instructions to trains. all while trying to keep to the timetable (often complex) and ensure everything is running smoothly. Add in the chance of snow, rain and wind and you can imagine sometimes, it is not a very pleasant job. Without full signalling it also has an impact on the functionality. 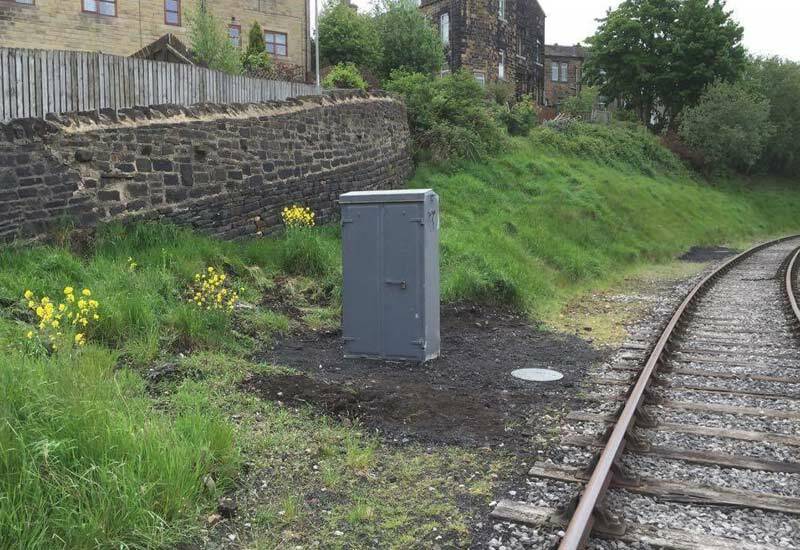 The Signal Box at Keighley was brought to the railway, in bits, from Shipley Bingley Junction when that particularly box closed. Since then there has been steady progress to commissioning full signalling. Progress so far has mostly been hidden. Extensive works have been undertaken to install all the cable ducting required for the scheme. Ducting has been fitted from the box up to Globe Curve Cabin (the top of Keighley Bank) and also back along under Bridge 72 (Station Bridge). This ducting was practically completed this year. Many of the lineside cabinets and location boxes have now been placed with further progress made on these this year, including covering the graffiti they acquired in a previous life. The token machine has been moved to a more convenient position within Keighley West Cabin, an important job as the existing arrangements will still be required for a good while yet. The final major piece of work for this year was the installation of trap points on the turntable road. This is for the purpose of derailing any run away trains from Keighley Head Shunt. The orientation of the turntable road means these could end up lying across the Leeds – Skipton Network Rail line. Not ideal! In addition, we also fit in some useful Civil Engineering or Permanent Way jobs into S&T week taking the opportunity the possession provides us. In the past this has included works on the Mytholmes Land Slips, works to bridges and repairs to retaining walls. This year the annual weed killing activities took place. It is a very important task that often goes unnoticed, mainly because we don’t do it when the railway is closed. For many years we have been able to undertake the task in house with volunteers but, unfortunately, with very particular competencies needed for deciding on the chemicals to be used it was decided that we would use a contractor this year. With a few hiccups along the way, work was finally agreed with Weedfree but not before our originally contractor cancelled at short notice due to the theft of equipment. The work was finally completed using their land rover road rail vehicle. Next it will be the signals and more work to the box itself, but not until the design is finished and approved. A lot of work is yet to do but the groundwork, for now, is finished. If you have any interest in being a part of the Civil and S&T department please do get in touch with our volunteer liaison officer. Contact details are available on the website. In what we hope will be a regular feature during the year, we are delighted to receive James Barlow’s report on the Civil Maintenance matters around the Railway. Well it’s not been the best winter we have ever had that is for sure! Whilst our midweek ‘Thursday Gang’ have been cracking on with several jobs every week the weekend gang has been hit by weather and insufficient staff, possible attributed to the weather, so I will just stick to blaming that. December ended with us rectifying some of the problems encountered during the Boxing Day Floods, I am sure by now you have all seen the photos! From the Civil Maintenance Department’s perspective we got off relatively lightly. The majority of the problems were simply ballast scouring around bridge abutments and in Haworth platform. All were rectified satisfactorily by 11am on Sunday the 27th December. I think we justifiably gave ourselves a pat on the back for that particular achievement. Since then we have continued to work on Fridays with the works train removing the build-up of sedimentation on the downstream end of Bridge 27 (Bridge over the Beck outside Haworth Yard). Hopefully this should increase the capacity enough to prevent any flooding in the short term, as long as we don’t get any record breaking rainfall again! Outstanding work from last year’s Civil Week has continued with the plain line track brought up to the final alignment from the Oxenhope Loop North Turnout into Oxenhope Platform. 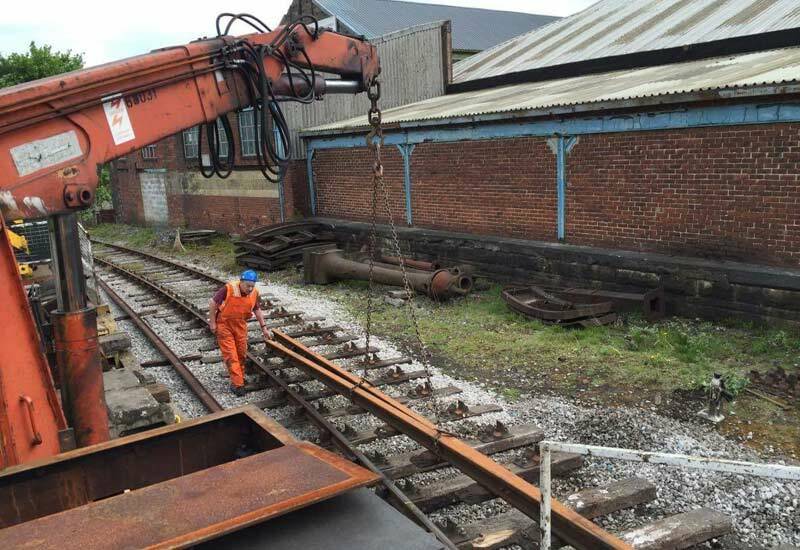 The work to bring the actual turnout up to final alignment has continually been delayed due to firstly frozen ballast, followed by torrential rain both working weekends during February. Although the early March snow did its best to halt proceedings once again it was finally completed before the Easter Weekend. This involved Kangoing (vibrating) stone underneath the sleepers to firm up the ballast bed. It also allowed us to make the first use of our new Seacow Ballast wagon. 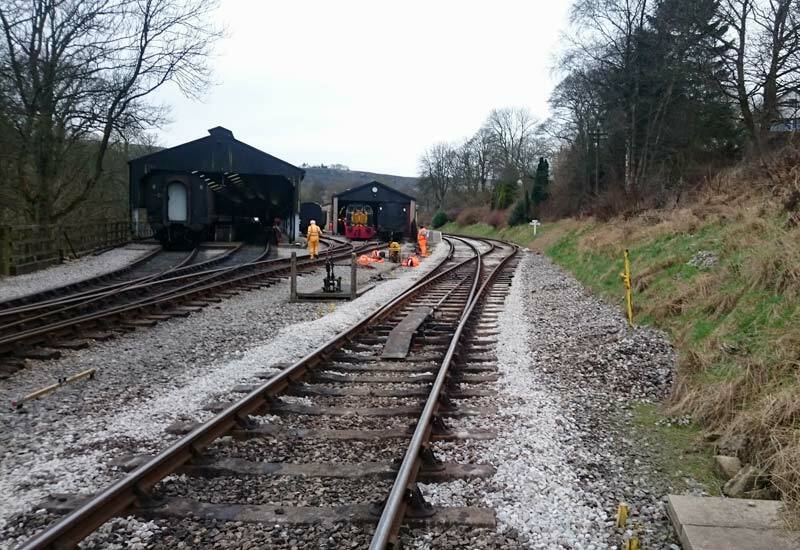 Work will now move onto finishing Haworth Loop South Turnout, which has remained in progress since Civil Week 2014. With the impending visit of a main line tamper focussing attention to finishing the job so it can be tamped at the end of April. Fingers Crossed! Civil Gang take a well earned rest in the background, with the Oxenhope turnout looking very smart in the foreground. Dropping ballast using the ‘new’ Seacow ballast wagon, on a rare sunny day. As further evidence that Civil Week is pretty much a Civil Year, we are already planning and preparing ourselves for this year’s Civil Week which will focus around Oakworth. Various jobs will be undertaken but as some involve outside parties nothing is set in stone. Hopefully the level crossing will be renewed along with the removal of the speed restriction alongside the yard imposed following the appearance of a rather unwelcome sink hole. The majority of the man power will be located at Ebor Lane, renewing the pads on the flat bottom rail there. 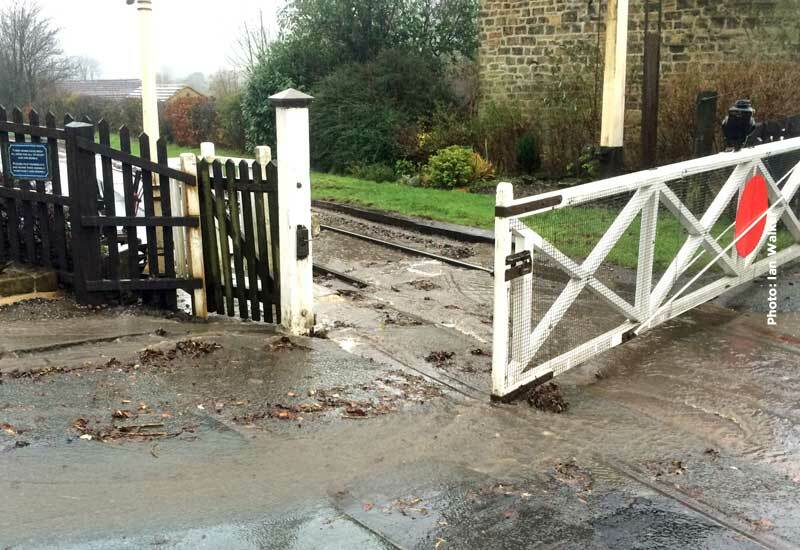 Hopefully work to the level crossing will result in a reduction in the flooding problems encountered and the impact it has on the track at Oakworth. There will be more information to follow in the Spring update. We also have our S&T Week fast approaching during May, the main focus as always will be progressing Keighley signalling. Again more information in the Spring update. Our ever steady ‘Thursday Gang’ has been having a productive few months with work on welding rail joints, repairing our boundary walls, clearing vegetation and investigating drains around Oakworth. 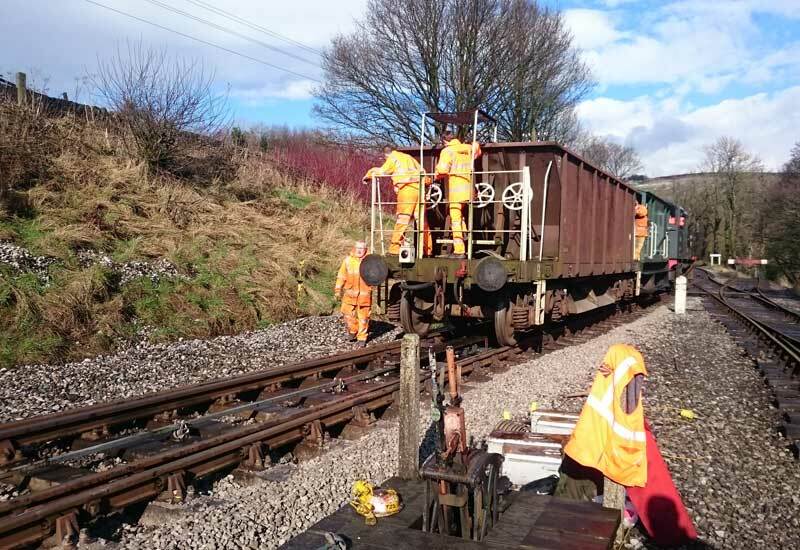 They have also assisted the weekend gang with work on Oxenhope Loop North Turnout allowing us to finish that job quicker and move onto Haworth Loop South Points during April. They certainly have a completed job list much longer than the weekend gang’s, and credit where it is due. 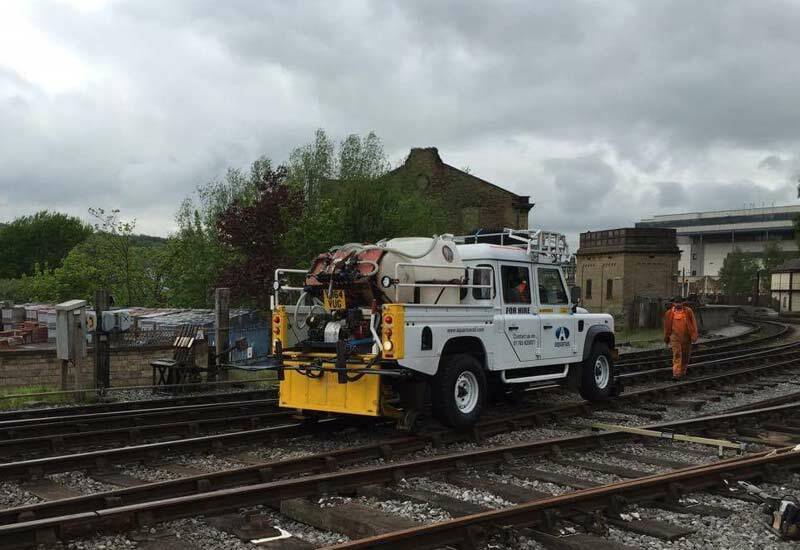 Mike Tarran reports that the Railway was visited this week by a tamper from Volker Rail as part of a training exercise for their operatives. 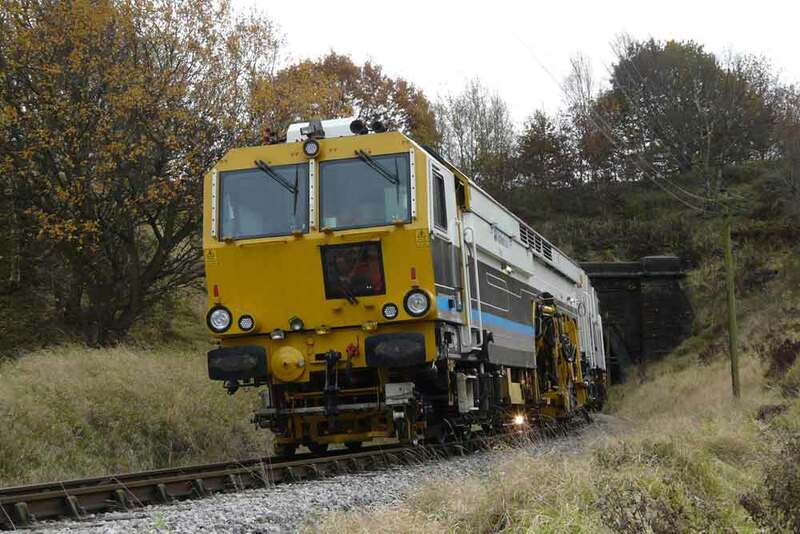 We reported earlier on the Civil Department’s possession of the running line at Bridge 17 between Oakworth and Haworth and to the south of Haworth at Haworth top points and this exercise was to tamper these two sections that had been re-laid during Civil Week. During Civil Week the main body of the gang renewed all the wooden sleepers on the check railed part of Keighley Curve, renewing the outer rail and chairs, and fettling the concrete chair fastenings on the few straight lengths of track from the end of Keighley Curve to the beginning of the check rail on Globe Inn Curve. The work at Oakworth consisted of exposing the footings of the small retaining wall in the cutting and renewing the pointing.